Making sure that health care needs are kept in check is essential – even if you are already covered by Medicare. That’s because Medicare Part A and B can be fraught with deductibles, copayments, and co-insurance costs. But having Medicare Supplement insurance can help to ensure that some – or even all – of Medicare’s uncovered portion of the bills don’t have to come directly out of your pocket. Before purchasing a Medicare Supplement plan, though, it is important to make sure that the underlying insurer is financially stable, and that it has a good reputation for paying out claims. 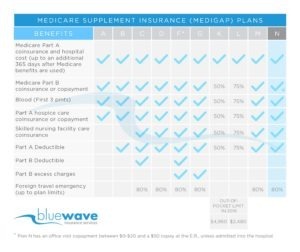 Bluewaveinsurance.com works with American National and many other Medicare Supplement insurance companies. If you have any questions or would like to receive a free quote comparison contact us directly at (800) 208-4974. For over 110 years, American National Insurance Company (also referred to simply as ANICO) has offered financial protection to its clients through a variety of insurance products. Headquartered in Galveston, Texas, American National today has more than 5 million policyholders. The company is publicly traded on the NASDAQ stock exchange. American National makes it easy for its policyholders to ask questions, view coverage information, and to file claims, as it provides a great deal of information directly via its website. • Portable Coverage – Your coverage through American National is portable, meaning that you’re covered, even if you are traveling across the country the plan will cover you. • Guaranteed Renewable – With a guaranteed renewable policy, once you have qualified, your insurability is guaranteed going forward – even if you contract a future illness or injury. • 30-Day Free Look Period – If you change your mind about the coverage, you have 30 days to return your American National Medicare Supplement policy and receive a full premium refund. • Household Discount (where available) – If your spouse or another member of your household applies for coverage at the same time you do, you may qualify for a premium discount on your coverage. • No Application Fee – Unlike some other Medigap carriers, there is no additional application fee with American National Insurance Company. For any insurance carrier, the ability to make good on claims is key for both short- and long-term survival in the industry. This is particularly the case with companies that deal in the costly health insurance niche. American National also operates various specialty companies. For example, Standard Life and Accident Insurance Company provides life insurance, as well as supplemental health insurance and Medicare Supplement coverage, to the senior market. Garden State Life Insurance Company provides simplified issue term and whole life insurance via direct response marketing. And, American National Life Insurance Company of Texas sells limited benefit health insurance products in certain niche markets. Life Insurance – American National’s life insurance options include both term and permanent coverage. With term life insurance, the policies provide a level benefit and premium for a set period of time. Permanent policies, which include whole life, universal life, and indexed universal life, provide death benefit protection, as well as tax-deferred cash value build up. Annuities – With people living longer lives today, ensuring a lasting retirement income is a major concern. An annuity can provide that – guaranteed. American National offers fixed deferred and index deferred annuities, as well as a single premium immediate annuity option. Property and Casualty Coverage – American National also has a number of property and casualty insurance alternatives, for personal and business needs. Health Insurance – The health insurance provided by American National includes credit disability, supplemental health, and Medicare Supplement insurance coverage. There are several different Medicare Supplement insurance plans to choose from through American National Insurance Company. Plan F provides the most comprehensive selection of benefits. However, this plan can also cost the most in terms of premium. If the higher premium is a concern, there is also a high-deductible version of Medicare Supplement Plan F that costs less on a monthly basis but requires a deductible to be met ($2,240 in 2018) before the plan starts to pay out benefits. 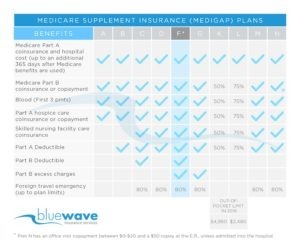 A better alternative – particularly if you are seeking a wide array of Medicare Supplement benefits, but at a lower premium cost – is Medigap Plan G. Other than the Medicare Part B deductible, Plan G offers the same coverage as Plan F, but usually for less premium outlay. 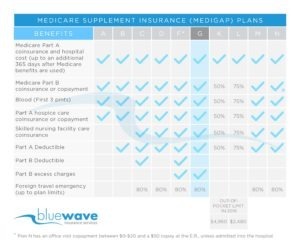 In fact, Medicare Supplement Plan G is our favorite of all the Medigap plans, given the lower premium – which can more than make up for the $183 Medicare Part B deductible that isn’t covered. In addition, for those who enroll in Medicare after January 1, 2020, Plan F will no longer be available for purchase. So, Plan G can also provide more stability with regard to premium rates going forward. As an alternative to Plan G or F, you could consider Medicare Supplement Plan N from American National. Here you will not have coverage for the Medicare Part B deductible, or the Part B excess charge. This Medigap option also requires an office visit copayment of up to $20, as well as a $50 copayment for emergency room visits that do not result in a hospital admission. That being said, though, the premiums charged for Medigap Plan N are also usually lower than Plans F or G. So, for those who want a fairly comprehensive plan that requires small charges here and there, this plan could be a viable option for you. Is American National Medicare Supplement Coverage Right For You? If you would like more information on the American National Medicare Supplement plans – or even if you just have a question about Medigap coverage in general – please feel free to reach out to us directly, toll-free, by calling (800) 208-4974. By comparing plans and prices, we can provide you with all of the additional details that you need for determining whether or not a Medicare Supplement insurance policy is right for you.